Customer.io helps you react to and influence the behavior of your audience – with unique, personalized communication – at scale. A deliberate approach to mapping your product's user and behavior data to Customer.io is critical for your success. As your product evolves, you’ll also want to consider how new features, or activities, are represented in Customer.io. This guide outlines how data is stored within Customer.io to help you plan your integration. You can also send us data via the API as part of API Triggered Broadcasts. Any data you send into Customer.io will serve your ability to segment your audience and personalize your messaging. A profile represents a person with a unique ID in your Customer.io account. Attributes describe the person or their current state. While Customer.io profiles correlate to your app’s database of users, not every database field needs to be reflected in Customer.io. Do not send sensitive, personal information to Customer.io, such as bank account information, personal health details, credit card numbers, or other secure details. This type of information should not be used directly in email or other types of messages due to their sensitive nature. Events map to actions your users take within your system (and occasionally to actions your service makes on a user’s behalf, such as recommendations). Track activities that users perform to derive value or enjoyment from your service. It's less productive to track generic, non-descriptive activities like button clicks. Instead, send in user activity that maps to specific, meaningful behavioral goals. Use a simple naming convention that is readable, easily understandable by your team members, and corresponds to the activity being tracked. API Triggered Broadcasts are a special campaign type, usually for sending one message to many people (for breaking news or specific notifications, for example), or recurring messages with different data, but with all of Customer.io's personalization powers. Profiles and their attributes describe your users. A profile represents a person—that is, anyone with a unique ID in your Customer.io account. Attributes describe the current state of a user. Customer attributes persist but update when a user’s state changes (except for the one customer attribute that cannot change: the id). For instance, if you track the location of your users, you may update their location attribute as the user’s location changes. When an attribute’s value is updated, the previous value is replaced. conditions for segmentation rules that determine who should receive a message. For instance, if you pass along current subscription plan (free / basic / premium) as an attribute, you can set up triggers to only send to customers who have subscribed to a particular plan (e.g. subscription_plan: premium). At least 1 contact attribute. For example, email, phone (when sending Twilio SMS) and/or named_user (when sending via Urban Airship Action). The id attribute is the unique identifier for a user within your database/service. The id is NOT mutable (the only attribute that cannot be changed). Each id attribute must be unique within your Customer.io account. Common data elements used for the id include: the SQL primary key from your database or the UUID. Avoid using email address or username as the id, as either value could be changed by your users. In order to reach users via email, you’ll need to store their email address. Customer.io requires this attribute field name to be email. Note that Customer.io does not enforce uniqueness of the email attribute and does not automatically dedupe email addresses for you. This allows flexibility. If you plan to use the Urban Airship Push Action, the named_user customer attribute should contain the named user detail that’s stored in your Urban Airship account. If you're planning to send push notifications directly from Customer.io, you'll need to identify specific tokens for those mobile devices. This is done with a PUT call to the devices endpoint of our API. You can add any attributes that describe your service’s users and their state within your service. Common important attributes include data such as first_name, last_name, city, or plan_level. Another good example is timezone; sending us this attribute will allow you to enable the Time Zone Match feature. There's no limit on the number of attributes stored per profile. However, each attribute value should be less than 10k of data. Learn more about how to use customer attributes within Customer.io. While customer attributes describe people, events are actions that users perform in your app or service. Events can also contain event attributes: data that describes details specific to an event. The event attributes describe the enrollment event: the title of the course, the name of the instructor, and the URL to access the course. Event attribute data should not contain customer attribute data. The event will be tied to the user profile. Event attributes are stored with the event and don’t change, since they describe the action your user performed. Event attributes are separate from user customer attributes and do not cause changes to a user’s customer attributes. only inside Event-Triggered Message content (not in Segment Triggered Campaign Messages or Newsletters). This is optional JSON that you can include as part of an API call each time you trigger an API Triggered Broadcast campaign. It usually includes dynamic new data that you're using as part of that specific broadcast, and it can change each time. We have both examples and formatting details of API Triggered Broadcast data formatting, as well as more detailed information on sending an API request. Attributes are mutable (with the exception of the id attribute). As a user continues to interact with your service, you’ll pass new values to Customer.io via the identify call. Customer attributes answer "who” questions, like "Who is currently on the Enterprise plan?”. Customer.io tracks all event data—and unlike an attribute, an event is never overwritten. Once a user performs an event, it will be a part of their recorded activity in Customer.io. Events answer "what happened?” questions like "has X event occurred within the last 7 days (or ever/never)? Customer attributes are changeable (except the id). When an attribute’s value is updated, the previous value is replaced. Attributes reflect the current state or value for a person's profile (e.g., name, location, email address). Once an attribute value is changed, the previous value is no longer accessible. When sending customer attributes, Customer.io will update only those attribute values that have changed or are new—and ignores attributes that already exist where the value has not changed. 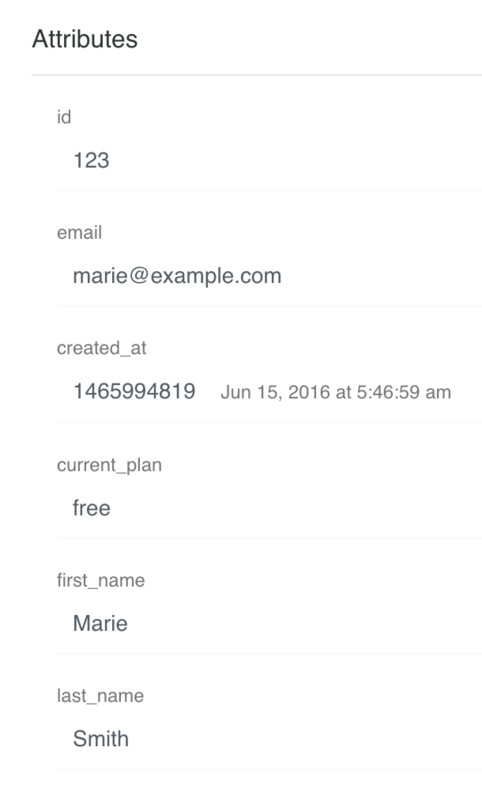 Attribute field names, once added to your Customer.io instance, persist. You can export your customer attribute attribute data (or specific segments) from the People search page. Each individual triggered broadcast has its own (optional) set of JSON data. Trigger data is separate from user customer attributes and doesn't cause changes to a user’s customer attributes. The data in a trigger is only accessible within that broadcast's individual messages. as variables that merge into the content of your messages. For instance, use attributes like first_name to personalize messages by displaying it in the subject or body. Event attributes are only available to merge into event-triggered message content. to define segmentation rules that target who should receive a message. API Triggered Broadcast data meanwhile, is sent as part of an API call that triggers a broadcast, and used by the messages within it. Each time you make an API call to send a broadcast, you can include JSON-formatted data with that call. This data is then accessed and used when you build your messages. We've got an explanation of API triggered broadcasts that explains this in more detail. Sometimes you’ll want to update a profile and track an event for the same user activity. A common example is when a user upgrades from a free plan to a paid plan. When the upgrade happens, your integration could update the customer attribute value representing the user’s state (changing it from "free” to "paid”) and track an event for the purchased_plan user activity. Let’s look at how this might be structured. Marie has been testing out my_app and has decided to purchase an annual enterprise plan. When Marie performs the conversion action of upgrading to Enterprise, both the identify and track requests can be called. Identify updates the state of the profile, or in other words, the customer attribute. Track creates the transaction (event) that the user, Marie, has performed. Customer.io will also know that Marie has performed the event purchased_plan. Questions like: "who has ever performed the event purchased_plan?" will include Marie regardless of her current state, whatever attribute is in her profile. Even if Marie decides to later change to a different plan, this question can always be asked. She will always have performed this event at least once. Customer.io allows an unlimited number of customer attributes. The size of customer attribute data should be less than 1000 bytes per attribute. Events can have an unlimited number of event attributes. The total payload of the event should be less than 10000 bytes. When sending data to Customer.io, API calls should be limited to 30 requests per second. This recommendation applies to both active data integrations, as well as historical backfill scripts. Attribute names ARE case sensitive. Pick a consistent pattern for all of your attribute names (all lower case, proper case, etc). Avoid using whitespace in attribute names. Use underscores to replace spaces, like first_name. Trim leading/trailing whitespace to avoid duplicate data. We also recommend not using spaces in event names (e.g., your_event_name, not your event name). Attributes can be a string, boolean or a number. Once you complete your integration, data will flow into Customer.io as users interact with your service. However, you may want to backfill your historical data in Customer.io, especially if you want to do any re-engagement or retention efforts. Important: Historical event data should include the timestamp when the event originally occurred. If the timestamp is not included, Customer.io will interpret the event as occurring at the time of import. Access customer attributes to personalize and customize your message using Liquid. Segment recipients based on customer attribute, event history, pageview, and message activity data. Access attribute and event data (as events happen, going forward) to personalize and customize your message using Liquid. Trigger messages based on an event. There are additional recipient filtering options, using segments based on customer attribute, event history, pageview, and message activity data. Trigger messages via the API, or manually in the UI. Customize messages further using specific trigger data provided in the API call or manual send. Note: This is an example of an event that is triggered on behalf of your user by your service (rather than directly by the user). In most cases, you would trigger these events with a scheduled/cron job on your system. It is possible to use Customer.io’s webhook Action to initiate the job/service that queries your dynamic data and generates an event to Customer.io.